Thanks so much for your prayers during this busy but beautiful autumn season. On October 16th, we had a new baby daughter. We named our 21 inch and 9.3 pound girl Rebekah Ruth. The home birth went very well. Absolutely no complications. We are so thankful for how well Linda and the baby are doing. Thanks for all your cards, emails and prayers. It was great to have Linda's mom here for a couple of weeks. A special thanksgiving is that the baby came just hours before Elizabeth needed to go to Alabama to be in a wedding. God is revealing a lot of worry in people these days with the unsupported stock market, 911, the war and now the threat of anthrax. This is the reason Paul sensed God has him working on this timely seminar on "Overcoming Anxiety: Finding Peace, Discovering God." Of course with extra home duties, Paul has been learning a lot on how to trust God with near impossible situations. Part of God's provision has been the help of his two older girls. Be careful if you ever teach on overcoming anxiety for you will have plenty of situations to test you! The ten session seminar has required a lot of work but is coming along nicely. Paul needs lots of wisdom as he coordinates all the lessons (about 150 slides each with a mini sermon). Praise God that Paul can present this 10 session seminar starting November 4th at the Pittsburgh Chinese Church at Oakland - English adult Sunday School class. He is looking for ways to show the slide presentation direct from the computer rather than using lots of overheads. Pray for extra wisdom on this and on developing effective handouts. Paul seeks to convince each of these 35+ attendees to be more convinced of God's greatness by the way He overcomes their worries and fears. Paul's long term vision is to reproduce this series in an inexpensive way to renew the faith of Christians and spread the gospel to many others. He sees this could be a first step of developing a new wave of evangelistic materials. Attending this seminar is a way to meet God. He is looking for ways to attach audio to the slideshow presentation and make the seminar more available on common medium like Library and Library as well as accessible on the web. Where is he going to find time to do this? Pray for help and translators. Paul's other deadline is fast closing with the end of October. He needs extra grace to publish (put on the web) a web series for "The Godly Man." He has only a few days left! This exciting series is on developing humility. Special studies include Isaiah 53 and Philippians 2 and meant to be very practical. Humility is a long lost element in Christ's church. How many of you have or been taught to seek humility? This study reminds me how far the church has slid into the world rather than living in God's presence. Praise God for the safe delivery for Linda and the birth of our little (9.3 pounds big!) 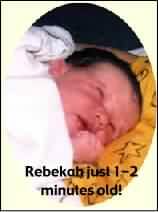 Rebekah. Praise that our colds left just before the baby came. Linda's sleep is better than at prebirth. Of course Linda is up once or twice at night to feed the precious little one, but she is getting a much better sleep. Most of the "Humility, not Pride" series is done - but not all! Deadline: Oct. 31 Wednesday. A twin ordination on October 20th went well. Great to see new leaders coming up behind you. Thanks for the opportunity to teach the seminar. Pray for God's Spirit to use this seminar to draw each of the participants closer to Himself each Sunday 5:30 PM at the Pittsburgh Chinese Church in Oakland. Pray for God's peace that passeth all understanding. Pray for more openings to teach this seminar. Ask God for help on the technological side of things for the presentation and possible future development of the materials. Pray for wisdom and God's leading as he develops the materials on overcoming anxiety. He is trying to present just what God would have him say and write. Continue to pray for full strength and restoration for Linda and good health for all. Pray for E.A. from Ghana who shares, "I want to work in the Lord's vineyard in Africa." He is burdened for the rural area. He also asks us for material! I would not think about this request except that I have already started on a specially designed discipleship material for the third-world situation, one which can be easily communicated, culturally sensitive and not dependent upon materials. Keep those engines of prayer hot! Pray for God's kingdom to come in glory! Track God's answers of your prayers here!